As of May 2017, the population of Uganda is 41.5 million people. Of these, about 22.6 million are cellular users. Uganda's telecommunications infrastructure is well developed. Its annual growth is 10%. This opens up good prospects for starting a GoIP traffic termination business. The average rate for this direction is $0.1 per minute, while the rates for local cellular communication are minimal. 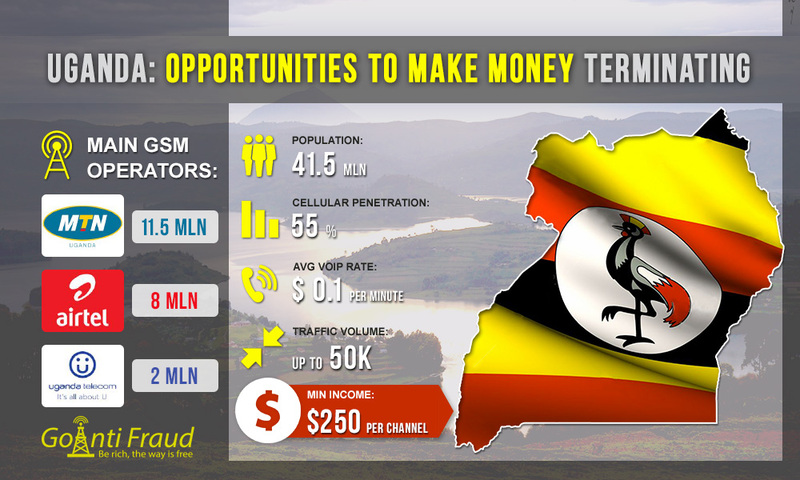 In the last years, the economy of Uganda has steadily grown and has positively affected telecommunication sector. A number of reforms that aimed at developing one of the most competitive markets in the region have been taken. As the second national operator (after Uganda Telecom) MTN was admitted to the mobile market of the country. The competition between the two mobile companies made a real revolution in the sector and ensured the availability of services. The largest GSM operator in Uganda is MTN as its subscriber base includes more than 11.5 million users. The second in terms of market coverage is Airtel. Its services are used by more than 8 million people. The subscriber base of Uganda Telecom consists of over 2 million people. Uganda's mobile operators provide services not only in cities but in most rural areas as well. But the fact is that signal quality can be unstable in some localities. Pre-paid SIM-cards are widely available: they are sold at airports, branded stores, as well as by street vendors. It is better to buy start packages from traders on the street, so as not to show documents. The cost of a SIM-card in the country is about $0.55. At the same time, MTN immediately provides $0.14 bonuses to the subscriber's account. On average, a minute of a local call costs 5 cents. Terminating 5 hours a day, you will be able to make $250 from each channel. Using numerous SIM-cards and controlling them via the goip sim server, you can earn much more in Uganda.